I joined OGR Stock Denton’s litigation department in December 2017 and have since gained valuable experience in a wide variety of contentious matters. These include contentious probate matters, personal injury claims and property disputes. I assist with acting for claimants and defendants as well as individuals, corporate and commercial clients. I am confident in engaging with new clients to ascertain all salient facts and objectives of their case, establishing myself as a reliable point of contact and assisting the department’s fee earners in every step of their case. Prior to joining OGR Stock Denton, I gained property litigation experience at a boutique city law firm and assisted partners in a range of civil litigation matters under the laws of private nuisance, misrepresentation and professional negligence. I also conducted legal research for group litigation procedures. 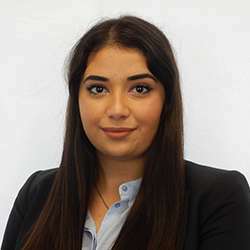 I am interested in pursuing a successful career in litigation and look forward to beginning my LPC studies part –time in February 2019 at BPP University. I completed a BSc in Criminology and Sociology at Royal Holloway, University of London, before studying a Graduate Diploma in Law (GDL) at Kaplan Law School. Outside of work I enjoy oil painting, travelling and baking.